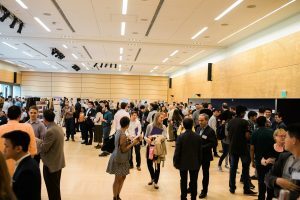 The 2018 2018 UW Electrical Engineering Capstone Fair was well attended. Students, facutly, staff, industry sponsors, and family and friends were in attendance. 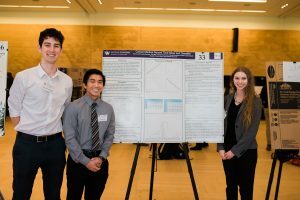 Students in UW’s Department of Electrical Engineering had a chance to showcase their innovation, systems engineering and project management talents at this year’s Electrical Engineering Capstone Fair on June 1, in the Husky Union Building. UW EE capstones are the culmination of a student’s electrical engineering education. More than 35 projects were presented, addressing issues on health, power and energy, transportation, the environment, artificial intelligence and communications. To get a detailed look at the projects, please click on the program below. Winning team OceanLens ROV Underwater Recharging and Data Transfer made up of UW EE students Ishan Sharma, Jeffrey Chrisope and Rachel Kominek. The winning team of the evening was OceanLens ROV Underwater Recharging and Data Transfer. Chosen by peers, industry partners and faculty, students Ishan Sharma, Jeffrey Chrisope and Rachel Kominek, were announced the winners. 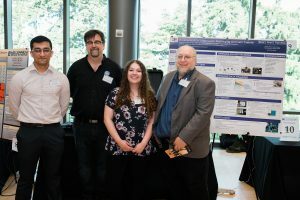 Working under the guidance of faculty advisor Howard Chizeck, they designed, built and tested a system for wireless underwater charging and data transfer for a remotely operated underwater vehicle, including an autonomous self-docking module. 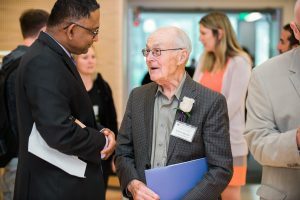 None of the evening would be possible without the industry sponsors, who mentored students as a part of the UW Electrical Engineering Entrepreneurial Capstone Program (ENGINE), and Milton (BSEE ’60) and Delia Zeutschel. Through endowing the ENGINE program, the Zeutschels are helping to secure the futures of UW EE engineers and promoting local and statewide innovation. To see all of the photos from Capstone, click here. Professor and Chair Radha Poovendran and Milton Zeutschel. Cece Landau, Alex Kasiniak and Kevin Lau show their work on the Cancer Medical Record Time-Slicer and Classifier.